Study Shows 73% of Americans Haven’t Heard of Online Office Suites, Should We Be Surprised? Download Squad is reporting on a recent NPD study that shows 74% of Americans haven’t heard of Google Docs or any other online office suite. 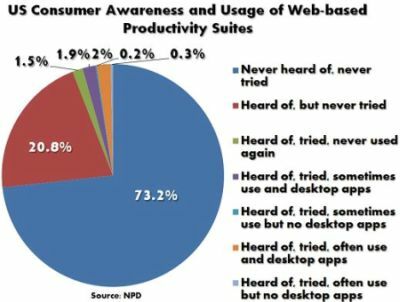 Out of 600 PC users, NPD found that around 94% had never tried any web-based office suite, although around 20% have at least heard of them. You can catch the full breakdown of results on the chart below. Download Squad sourced Microsoft Watch for this story, who read a bit more into these results and proclaimed that the end was near for the Web 2.0 office suite. But is that really the case? I don’t think we should be surprised that most U.S. PC users haven’t heard of these web applications. After all, there is practically no publicity for this stuff outside of technology websites and magazines. And while they’re occasionally mentioned in the tech sections of mainstream media outlets, I would wager that those sections still don’t get much attention from non-techy readers. My point is this: Technology enthusiasts, just like any niche, converse on a completely different level from general users. We should expect that topics we live with every day are completely alien to normal PC users. In these cases we need to put ourselves in the shoes of these users to understand the best way to communicate newfound concepts to them. Microsoft Watch is completely insensitive of these considerations, which explains why they believe online productivity suites are already dead when they have barely had a chance to prove themselves. These online suites may not become household names tomorrow but it will happen eventually, as proven by their examples of other successful online applications like tax preparation software. The biggest barrier to their success is of course Microsoft, whose Office suite is practically synonymous with productivity software on PCs. Microsoft has also trained the majority of PC users to buy their software in stores, so someone is going to have to change their mindset. My money would be on Google. At some point they’ll have to drop that “Beta” tag on Google Docs and start a real ad campaign. They can’t just make the public aware of these online office suites, however. They also have to prove that their data will be safe, and that their online software contains all of the features they normally use in Microsoft Office. It won’t be easy, but Google is one of the few companies with enough brand clout and money to make it happen. Until then, these suites, just like pretty much every new Web 2.0 trend, will remain in the domain of technology enthusiasts. Few comments on the point of anonymity of online docs. As I see it, most of these services are in the beta phase. Essentially it holds good for companies to not market a product when it is in the beta phase. The online productivity suites stand to benefit from the testing that the generic technology enthusiast’s usage brings. As far as advertising goes, I am sure that Google for one has taken a more proactive stance. Have you noticed the ads for Google Docs on technology sites. Earlier the company never had to put out anything for the search and it has been this phenomenal success. I guess it all comes down to functionality. As and when the product delivers real killer features, the brand becomes its own advertisement.